Which annuity is the best way to fund your retirement – a level annuity or an escalating annuity? A level annuity provides a fixed income that won’t change until the day you die. In real terms though its value is gradually lapped away by inflation’s sand-papery tongue. When you compare  the two types, it’s hard not to be seduced by the instant riches offered by the level annuity. For example, I can currently bag a £20,800 level annuity2  for the same price as a £12,500 escalating RPI annuity. That’s over 66% more income for taking the fix. And as it turns out it is. Compelling research  by Professor of Retirement Income, Wade Pfau, suggests that the most efficient asset allocation  for retirees may well be a mix of equities and level annuities.3  In this scenario, any surplus cash generated by the level annuity over and above the retiree’s income needs is invested 100% into equities to create some upside. So, continuing the example above, I can invest £8,3004  of my £20,800 level annuity income into the stock market (in year one of my retirement), given that I had intended getting by on the £12,500 a year offered by the escalating annuity. 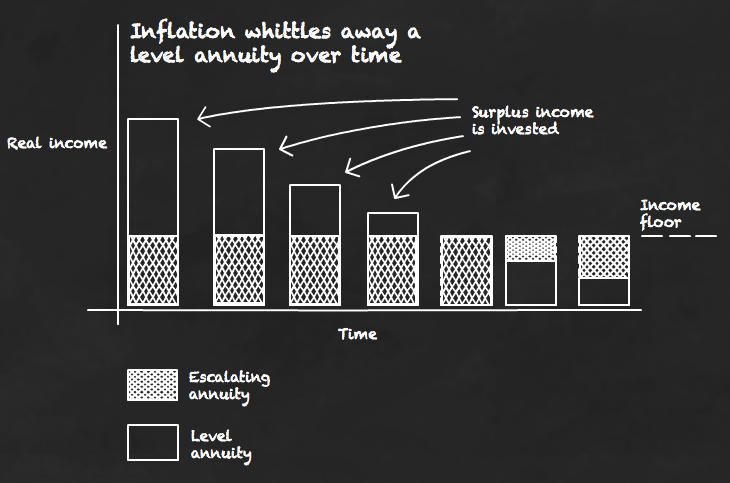 As and when inflation erodes the level annuity’s real income below my minimum income floor , then the equity portfolio can be tapped for a top-up or to buy another annuity. Equally, the equity portfolio can be a source of lifestyle income, emergency funds, or a legacy when the time comes. Let’s say I am 65. I took to my spreadsheets and worked out that I could maintain my income for 44 years until I age 109 using the Pfau strategy. If I shuffled off at 84 then I would leave an inheritance of £120,000 in today’s money into the bargain. If I lived any longer, then I spend the lot on another level annuity to keep myself going. Indeed the major flaw in my calculations is that I assume inflation and asset growth trot along smoothly at their historically average levels. A Monte Carlo sim  would give me a better idea of the range of possibilities. In some inflation and growth rate scenarios I’d end up filthy rich. In others, filthy poor. Where things really come unstuck for the level annuity though is when inflation  makes like David Banner  and bursts out of its corset in a big, green, income smashathon. You can estimate the damage for yourself using a level vs escalating annuity  calculator. From then on you can die happy. 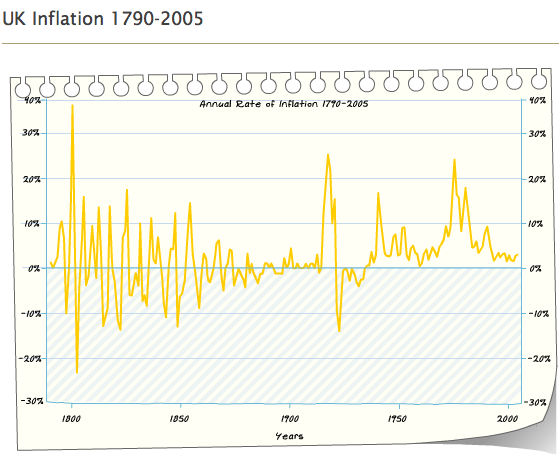 But, but, the tide can turn against the level annuity very quickly when inflation runs wild. If prices rise by 13% a year then the escalating annuity pays a higher income within five years. And it pays a higher total income in just eight – that’s shockingly fast. So when did inflation last average 13% a year in the UK? In the 1970s, peaking at 25% in 1975. Ultimately, a level annuity offers more flexibility, growth, and value for money, but it does not offer certainty, security, or safety .